The Demons had four century makers over the course of the weekend – Peter Petricola and Andre De Lange (both 2nds), Charles Lill (3rds) and Melina Ayres (2nds), plus a five-wicket haul to Fergus O’Neill (3rds). It was also a weekend that saw the men bring up a ‘Demon Day’ on Saturday although they came up empty handed in the Sunday round. Not to be outdone, the women’s teams came up trumps by posting three wins to claim a ‘Demonette day’. Our women’s 1sts travelled to Aberfeldie Park on Sunday to take on EMP. The home team batted first and posted a reasonably challenging 7/216 off 50 overs with Amy Yates taking 4 for 39 from her 10 overs. Amy carried on her good day’s work by opened the batting and set the chase up in making 55 off 65 balls laced with 10 fours. Teagan Parker (37) helped keep the innings on track before Elly Donald (60 n.o. off 83 balls, nine 4s) did a superb job guiding her team home. Amy’s double saw her named ‘Women’s Premier Player of the Week’ – congratulations! The women’s 2nds welcomed Melina Ayres back into Demon colours – Melina’s appearances being limited due to her W-League commitments with Melbourne Victory. It didn’t take long for Melina to find her touch as she made 105 n.o. off 96 balls (nine 4s and two 6s) to help her side along to 5/229 with Jess Grant (34) being next best contributor. A dominant performance with the ball helped us to a 135-run win with Clem Ryan-Fuller and Stephanie Nichols each taking three wickets. Our women’s 3rds opened their season’s account winning their T20 against Box Hill by 38 runs. Yolanne Carvalho (36 n.o. ), Brook Pay (41) and Chelsea Wemyss (20) built the innings to a final tally of 3/128. The ball was well shared around with Abbey Samild finishing with the very neat figures of 2 for 2 off 2 overs. The men’s 1sts retained the Bruce Church Perpetual Trophy in defeating Kingston Hawks. Will Pucovski (71) lead the way with the bat and Seb Gotch added 44. A total well less than 9/225 looked likely until a special cameo from Ussie Saddiq (32 off 13 balls) where he plonked three sixes and two fours in the last over. A solid bowling display headed by Kieran Elliot (4/27) and Sean Sturrock (3/36) dismissed the Hawks 53 adrift.The 2nd XI was brilliantly served by dual centurions, Peter Petricola (120 off 130 balls, 13 fours and for 6s) and Andre De Lange (124 off 139 balls, eight 4s and four 6s who figured in a 200+ run 2nd wicket partnership (no FOW available!) to set up our 4/280. This was easily defended with Sean Griffin (3/18 off 8 overs) impressing. The 3rds had a day of ‘firsts’ at our new Beaumaris SC home. Playing on the South Oval (the North will be action this weekend), we had our first century maker, Charles Lill cracking 121 off 118 balls (16 fours and two 6s), his first for Melbourne. (For the uninitiated, yes, Charles is the grandson of former long serving MCC CEO and Demon cricketer Dr John Lill). The other ‘firsts’ were one of Charles sixes managing to find the pond in the wetlands over ‘cow corner’, then Alex Cesarios managed to clear the high net at the Long Hollow scrub resulting in a second lost ball. In reply our bowlers were on the money throughout with Fergus O’Neill starring with the amazing figures of five for 10 off his nine overs – imagine how much better that would have read had he not sent down five wides! Trent Thompson chimed in for three to knock over the Hawks for just 93. Our 4ths held Kingston Hawks to 6/147 with Shane Giese (2/33) being the multiple wicket taker. Pat Frawley (63) started the chase in fine style and Josh Benson (25 n.o.) saw his team home with six wickets and seven overs in hand. The men’s 1sts and 2nds backed up with a one-day round against Melbourne University minus five players who set off on Victorian duty. The 1st XI were involved in a tight, competitive tussle all day before going down by three wickets in the last over of the day, handing over the Michael Sholly Cup for the first time. We set Uni 212 thanks to a half century from Matthew Brown and Blake Thomson doing next best with 42. 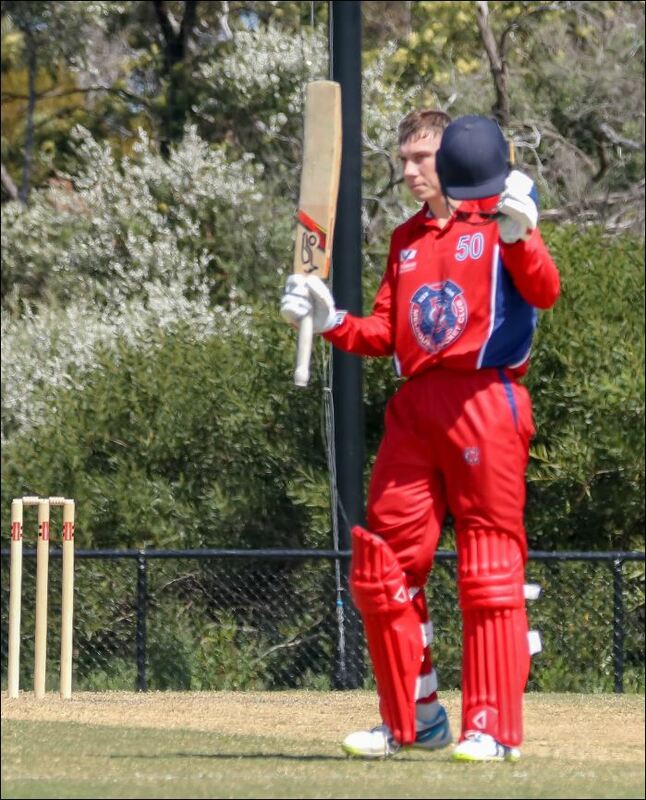 Aaron Boyle, having returned to Melbourne after a four-year stint at Uni, was promoted to the1st XI to play his former club and returned a handy 3/36 off his nine overs. The 2nds let Uni get away a little, posting 7/260. Pat Smith (2/37 off 9) did well in his first outing of the season and Brad Melville bowled a tidy ten overs for 2/44. Unfortunately the response was scattered with 20s and 30s, with Campbell Kellaway (37) doing best in his 2nd XI debut. As referred to earlier, the club is proud to boast five players in the starting XI that play Western Australian in their opening Sheffield Shield match of the season that started today. Special mention to Jackson Coleman who makes his first-class debut following his good performances in Victoria’s successful JLT Cup campaign. Jackson joins Melbourne team mates Seb Gotch, Will Pucovski, Chris Tremain ad Cameron White in the Vic line-up.